Uma! known affectionately to those who love her as BOOM BOOM! or just The BOOM! And she does... personality is bigger than life and just so much fun to have around... I am just "t!ckled p!nk" to have her! And being P!nk's daughter, we had to add some !!!! Uma finished quickly in very limited showing. 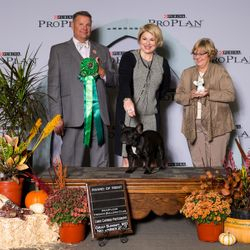 Winning or placing two years in a row in her class at the National under 3 breeder judges. 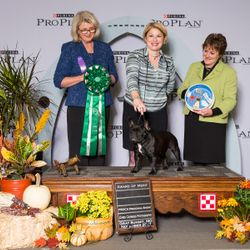 She earned a Best puppy in Show, multiple breed wins and wins over specials. 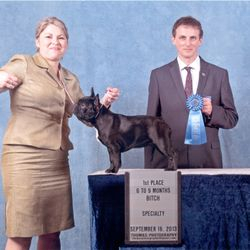 She earned a Group 3 from the classes and finished with 4 majors - the first Assisi owned or bred dog to do so. 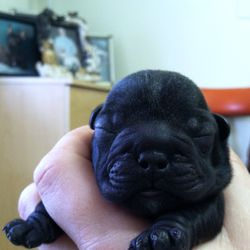 Always breeder/owner/handled. 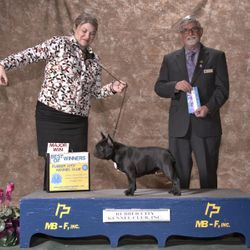 Uma finished her GRAND CHAMPIONSHIP in 11 shows, with 34 points and 4 majors! This girl is something special.... Perhaps we will see more of Uma in the specials ring! Uma came out of retirement in July of '17. 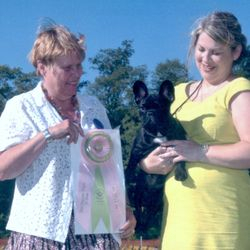 She hit the ring by winning Best of Breed and many top awards at supported entries. 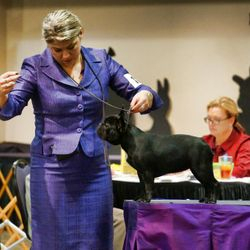 she then attended the 2017 FBDCA National Specialty and 2 regional specialties. in 2 of the 3 specialties, she was awarded an AWARD OR MERIT among a worthy group of specials. Uma in the Show Ring! 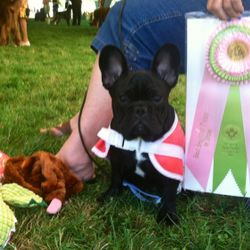 August 23, 2013: Uma started her show career off with a BEST PUPPY IN SHOW! 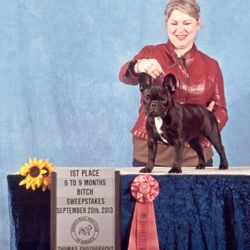 She is a 3rd generation Best Puppy in Show winner! 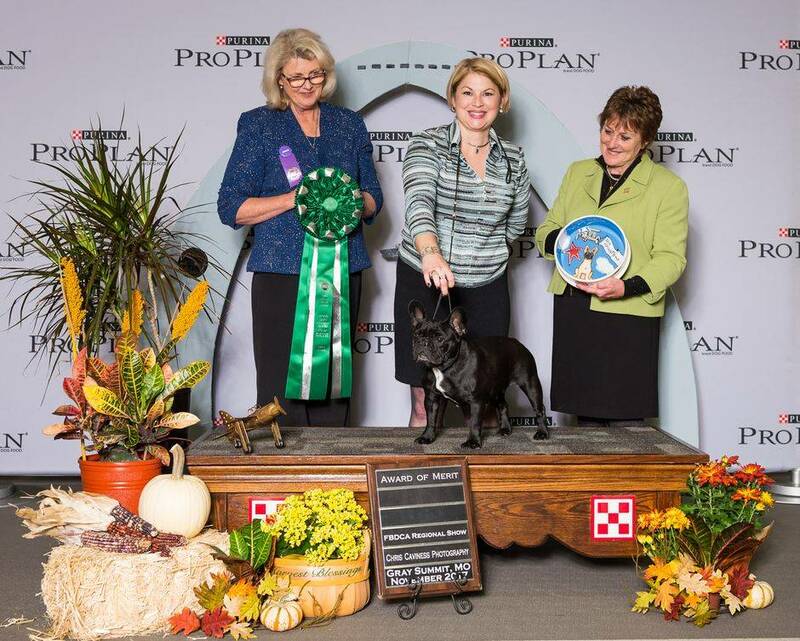 September, 2013: Uma attends the 2013 National Specialty and WON the HUGE 6-9 puppy class at both the independent specialty and sweepstakes! 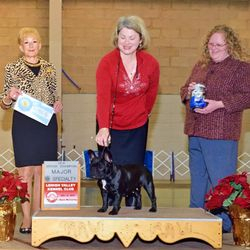 January 5, 2014: Uma's First weekend showing in all-breed competition results in WB/BOW and a 3 point MAJOR from Bred-By!!! July 12, 2014: After a hiatus, Uma returns to the ring and wins WB/BOS over a special for 2 points under a Mr. Yoshio Mori from Japan! 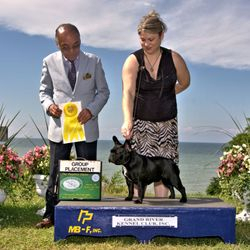 July 13, 2014: Uma wins WB/BOW and THE BREED over 4 specials under Mr Espen Engh from Norway. This gave her her second 3 point MAJOR. She then went on to win a GROUP 3 under Mr Mori! 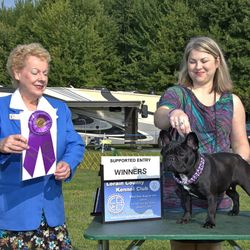 August 10, 2014: Uma wins WB/BOW & BOS over 3 specials for a 3 point major on the second day of the Lorain County FBDCA Supported Entry. She also went on to win Best Owner-handled and then a OH Group 1! 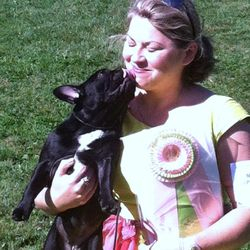 September 2014: 3rd place in the large and competitive BBE class. 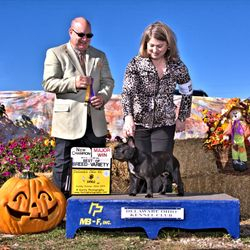 October 26, 2014: Uma wins WB/BOW and BEST OF BREED over 7 extremely competitive specials to finish with her 4th major, this time a 4 pointer! She went on to an Owner-Handled Group 3! Uma making me look good! BPIS! My toys are bigger than I am! American Champion Pretty Pretty Please d'Assisi American Grand Champion Belboulecan Liberte de Vivre CGC, ROMb CAN CH Southern Comfort By Gernada AM CH Blissbull Belboulecan Fernando CAN CH Night and Day L'Amour Brando "du Champagne"
Produced using Breeders Assistant for Dogs Pedigree Software (tel: +44 1223 290291), Personal Edition licensed to Lori Hunt, DVM.